One of the biggest advantages of the BASIS Independent model is the LET/SET teacher dynamic, creating greater learning opportunities for students and higher specialization of topics taught by educators. But what does this model actually look like in practice? 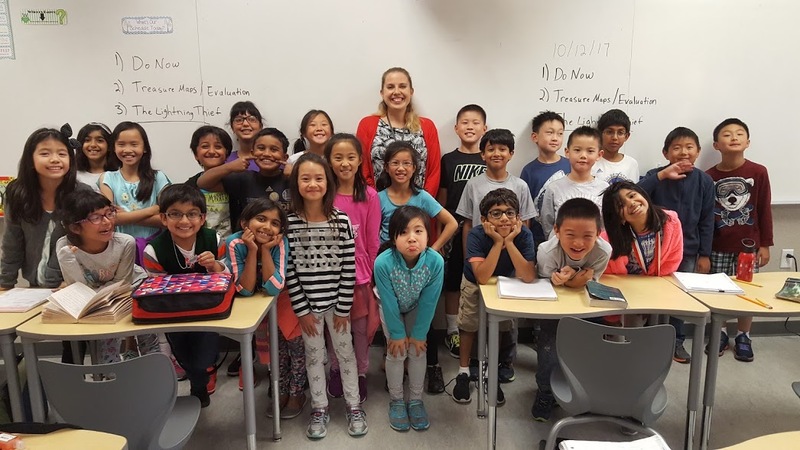 Last week, we followed Ms. Castilla, one of our Learning Expert Teachers, throughout her day to find out! 8:10am - Ms. Castilla picks up her third grade class from the cafeteria. She walks the class to Mathematics with Ms. Small, an SET. 8:20am - Ms. Small begins the day by reviewing last night's homework. Ms. Castilla walks around the room checking each student's CJ, minimizing lesson disruption and keeping everyone's attention focused on Ms. Small. 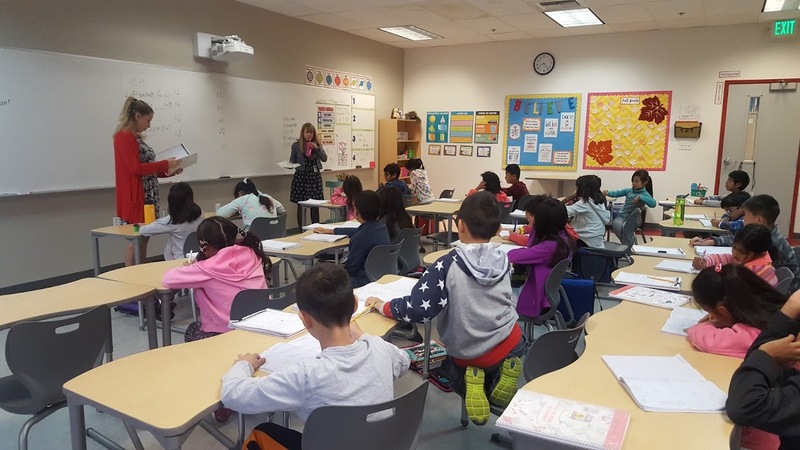 Ms. Small commences with the day's lesson, and Ms. Castilla reviews the homework assignment off to the side with a student who had correct but mis-numbered answers. 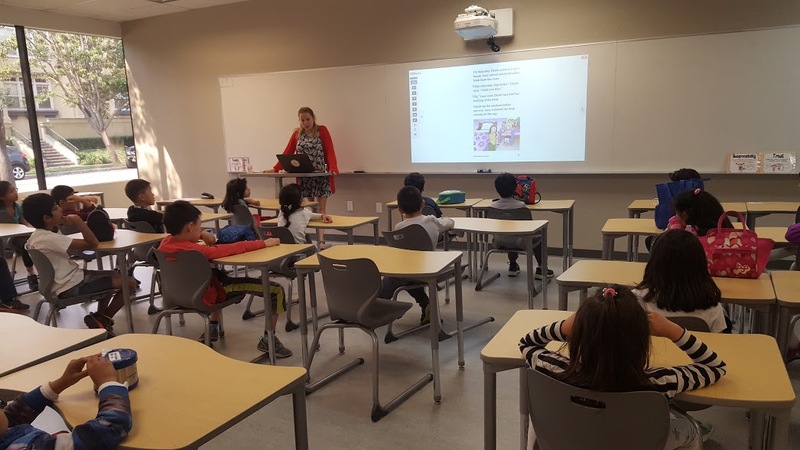 9:00am - It is International Day of the Girl, and Ms. Castilla has a pause in Ms. Small's lesson to talk to the class about what the day means. "I don't want someone else to tell you, 'No, you can't do that'," she explains. "The UN wants to make sure girls are inspired to do the careers they want to do." The students have many questions for Ms. Castilla and Ms. Small. 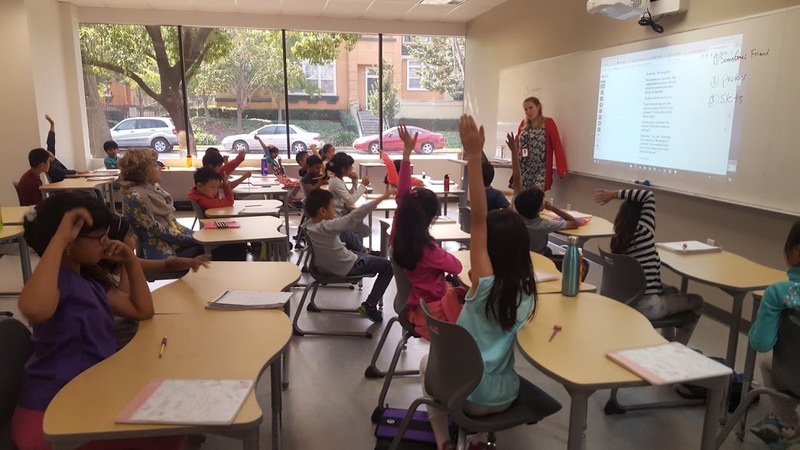 They are surprised that so few women end up in STEM careers, because many of the girls and boys love math right now and can't imagine not continuing to learn it. 9:50am - Ms. Castilla brings the students to PE. It is Wednesday, so they have Yoga with Ms. Burley. Ms. Castilla takes advantage of this class period to go to her office and finalize intervention plans to modify how some students are being supported in the classroom. This is also when she is available for parent meetings, though none are scheduled for today. 10:30am - Ms. Castilla gets her students from PE and walks with them to recess. 10:50am - The third graders line up at the end of recess, and Ms. Castilla escorts them to Reading class. 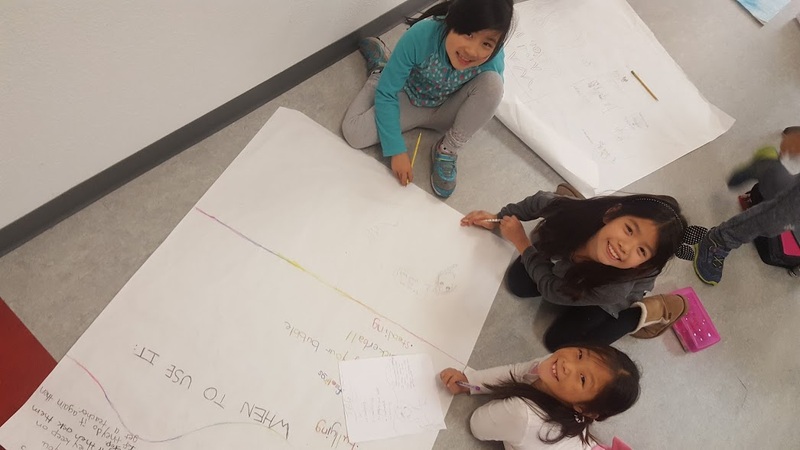 She has been using the Reading and Connections classes to work on the students' social emotional learning. Today's story is called "The Sometimes Friend," but a computer malfunction prevents Ms. Castilla from reading off the projected screen as planned. She quickly pivots and asks the students if they have more questions from the lessons earlier in the day as she reboots her computer. "What jobs are STEM?" several student ask. Ms. Castilla clarifies and asks the students if any of their moms or aunts work in STEM fields. Over half the hands in the classroom shoot up, and the kids are so excited to share how smart and amazing their moms are. Once the computer restarts, Ms. Castilla resumes her original lesson in reading "The Sometimes Friend." After each page, she asks questions about the contents to engage the students. The story is about the challenges that exist in making good friends and finding people who can be a positive influence in your life. "If someone is your friend, they'll want you to do your best and have more friends and be your most awesome self," Ms. Castilla says. 11:15am - Reading is over. Ms. Castilla walks the students to lunch. 11:30am - Ms. Castilla attends a meeting with her fellow LETs and Dr. Cavilla to discuss intervention plans and the weekly LET newsletters. 12:00pm - Ms. Castilla picks her students up from recess and walks them to Mandarin. They split into two classes: heritage and non-heritage speakers. Ms. Castilla takes this class time to organize student supplies for future lessons and have her lunch. 12:45pm - Ms. Castilla teaches Connections class today! She starts by finishing the book "The Sometimes Friend." 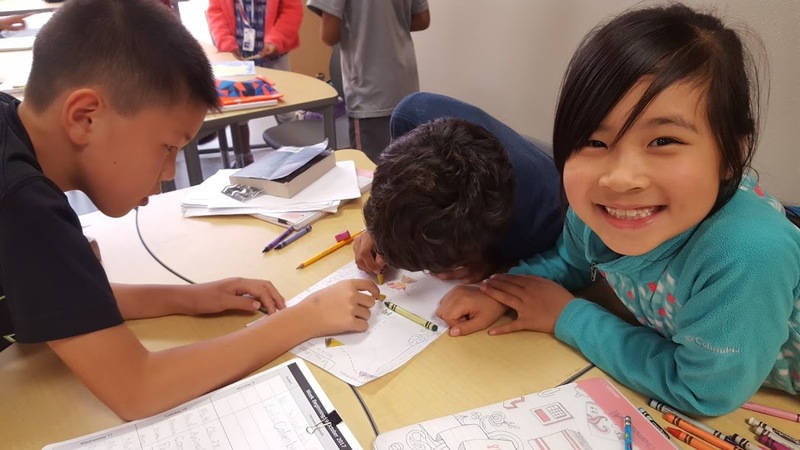 Her class has been learning about problem solving solutions that don't involve running immediately to an adult, and she asks the students which problem solving solutions they would use if they were the characters in the book. One of the characters, Lucy, is trying to make friends, and Dinah seems like a friend to Lucy but keeps preventing her from talking to other kids. Ms. Castilla's students list options for what Lucy can do in this situation. Several of the girls in class share that they have been in Lucy's place before at previous schools. "There are always problems you're going to have with people, and you need to talk about them and listen with empathy," Ms. Castilla says. 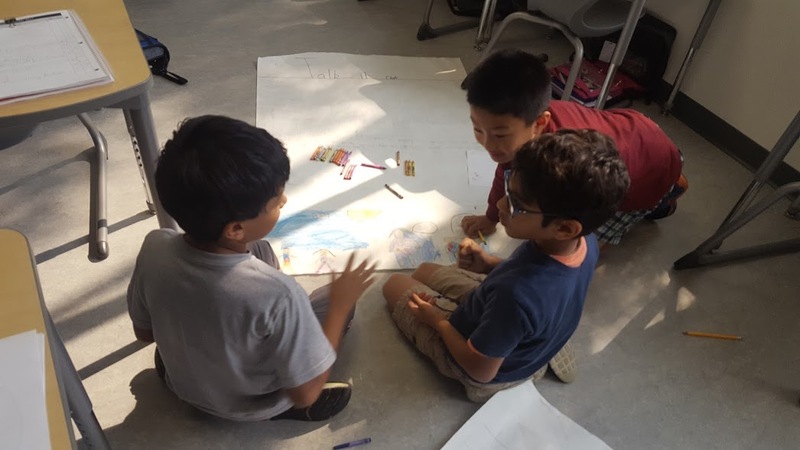 Once the book discussion is complete, the students resume working on their problem solving strategy posters they have been creating in groups. Once completed, they will hang in the cafeteria so the whole school can benefit from what the third graders have been learning. 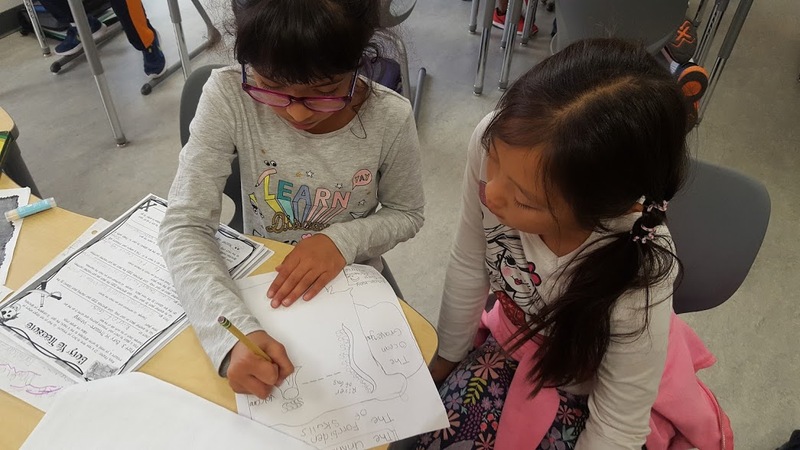 Group work can be challenging, and many of the students have been using the problem solving strategies they are learning to solve conflicts within their groups. 2:15pm - Recess is inside today due to air conditions, and many of the students choose to continue working on their posters. 2:30pm - Time for Humanities class with Ms. Wagner, another SET! The third graders are learning about maps today. 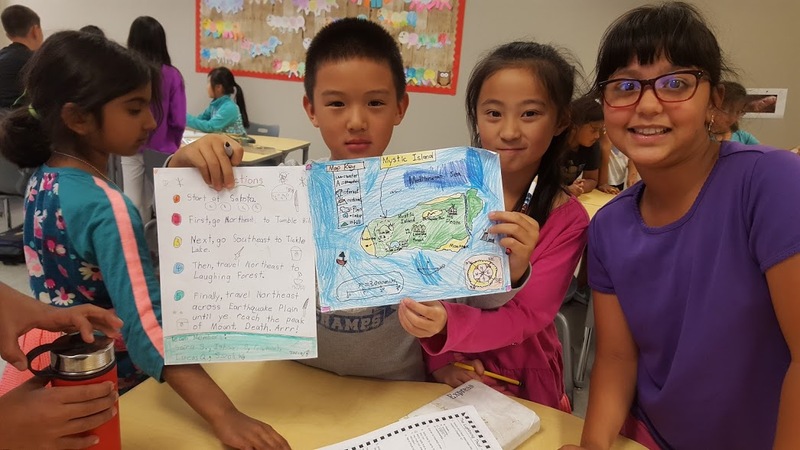 They are creating their own treasure maps to practice cardinal directions, map keys, and working together in groups. 3:30pm - Ms. Wagner leads the class in reading the book The Lightning Thief. Students take turns reading pages so the class can read the story together. 3:45pm - School is out! Ms. Castilla has afternoon traffic duties before heading home for the day. 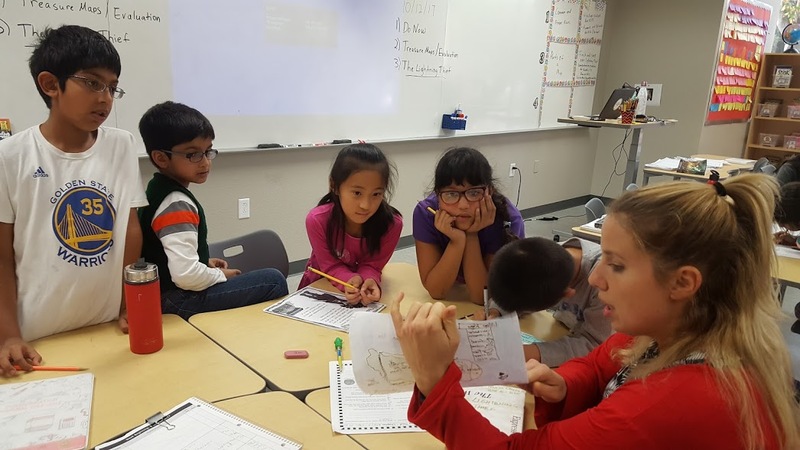 Since Ms. Castilla is with the same students all day long, she is able to connect with them and focus on their needs as students, while allowing SETs to lead their respective classes and focus on their specializations. LETs know their students and what their capabilities and areas for improvement are, and they communicate that information to parents and SETs so everyone involved with a student's education can be on the same page. During SET-led classes, LETs assist during the lessons as needed, helping to create lessons in some cases and helping students who need additional support in others. Together, the LET and SET create an environment where students can remain focused and interested. Don't miss our next post! Subscribe to our blog and stay tuned for the next post in our series exploring the LET/SET relationship at BASIS Independent Fremont. Follow us on Facebook, Instagram, and Twitter for the latest buzz from BASIS Independent Fremont!